Eines der ältesten Elemente Von Zusatzausstattung, das während gesamter Geschichte des Auto- Bestehens verwendet wurde, sind Auto-Gardinen, die zum ersten Auto von Kutschen übergegangen sind. Im Laufe des letzten Jahrhunderts hat die Entwicklung des Straßenverkehrs große Fortschritte gemacht, dementsprechend sind sich die auto-Gardinen geändert. Aber zu jeder Zeit waren die Gardinen eine Lösung, die der Gemütlichkeit und komfort drinnen des Fahrzeugs ermöglicht. Universal implementation of window tinting took on curtains. But everything is not so simple; in fact the window tinting is quite a “cold” decision, which visually shrinks the inner space of the car. In addition, let’s not forget about the limitations on light transmission of tinting in Russia and almost complete prohibition of tinting in some other countries. It should be also notices that it isn’t recommended to tint armored cars because of armored windows features. If on the street one pays attention to relation of number of cars with tinting and without one, it is simple to notice that more than 50 percents of cars are used without tinting of glasses. This implies that not everybody is comfortable with tinting. But from time to time the situations arise, when one wants to hide from the sun and strange glances. Please, try to put a baby in child safety seat and go for a spin in car with him in summertime. Or another situation – mobile multimedia. Various monitors – overhead, or mounted in headrests… The passengers are unadmirable. And once again the sun “disturbs”, car jam neighbors attempt to glance. Even the most impervious tinting not always comes to succour. While curtains are more preferable psychologically and practically. Because they create the atmosphere of comfort and coziness inside the car, create the mood, as well as emphasize the individuality of car owner. Curtains can be undrawn, drawn depending on the situation. Car curtains enable to decrease substantially the passenger compartment temperature during sun days. They also decrease the impact of ultraviolet radiation on materials of passenger compartment inner trim. The representatives of Spezo company told us as to the types of car curtains design. 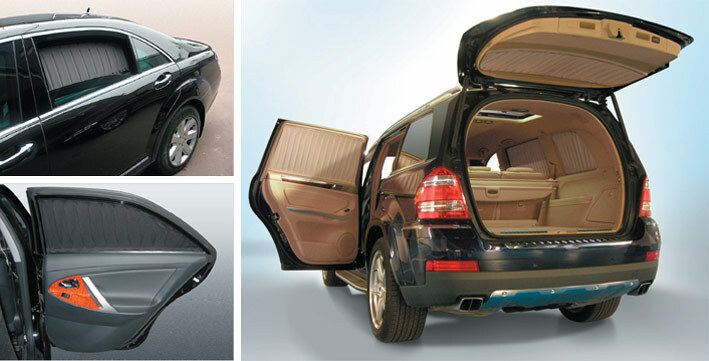 This studio specializes in development, manufacturing of car curtains, as well as accessories and materials for them. The company fills orders both dealer centers, tuning studios and private clients. Now, what are SPEZO curtains sets? SPEZO car curtains are special profiles, which are installed at the both top and bottom of window opening, between which the curtain canvas, which is made of textile fabric, is installed on special hangers-sliders. For the manufacturing of curtains the company uses single-purpose textile fabrics of high quality, which have high stability against physical and chemical actions and they are characterized by high stability of shape. And it means that car curtains won’t lose color, stretch and deform throughout the service life. Constantly SPEZO company specialists work on the color gamma expansion of its textile fabrics in accordance with last trends in car fashion. A range of requirements had been developed by SPEZO company, to which car curtains should correspond, here are a few of them: minimal gap clearances between the curtain and car panels in curtain’s drawn position; minimal space, which is overlapped by curtain in undrawn position; the curtains must look perfectly in both drawn position and undrawn one; the curtains should highlight the car’s general features. As well as they play the role of car’s interior seamless component. There are a few types of curtains design, developed by the company. The standard curtains – the most simple and inexpensive solution, which are characterized by absence of some sort of pleats on curtains in drawn position. In general this type of curtains enjoys popularity from company’s European clients. Curtains with tucks are at one step higher.